This is going to be one hell of a weekend I told myself on Friday night. Just like my header image I created couple of weeks before after signing up for four races. I have never attempted anything like this before so I was a little skeptical how everything was going to turn out and was keeping my fingers crossed that it should be favorable to me. This weekend would be special as I would be running a half marathon (Frost Bite) tomorrow and a full marathon (Mercedes Marathon) the next day. I packed my bags on Fri night after dinner. Charged up my Garmin, double checked my to-carry list and hit the bed. It was time. 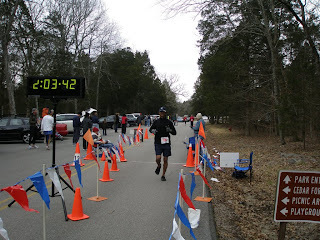 I was excited about running this one in my VFF. This would be the longest run on my VFF ever since I got them. The course was ‘relatively’ hilly and pretty much asphalt/gravel all the way. The race started on time and off we took off from the start line. Met a couple of folks from the ‘Flying Monkey’ marathon at the start line. They are everywhere. Again my VFF attracted lot of runner and were shooting questions at me. My answer was simple, ‘It’s great, my foot feels good, and you should give it a try’. I was feeling good running in them. I was starving by now. Headed to the rest area and grabbed three slices of pepperoni pizza, pretzels and mountain dew. Met couple more runners who have come all the way from Kentucky. There were lots of runners curious about my VFF. Had a nice conversation with all of them while hogging my pizza. Diane soon joined us. After walking around a bit, I headed to hit the shower. It was still freaking cold and hot shower felt great. My feet felt good. No soreness except for a little pain on my right ankle, can’t afford to get hurt especially with a marathon to run the tomorrow. It was 2:30 PM and we were all set to hit the road to Birmingham, AL for our Mercedes Marathon.